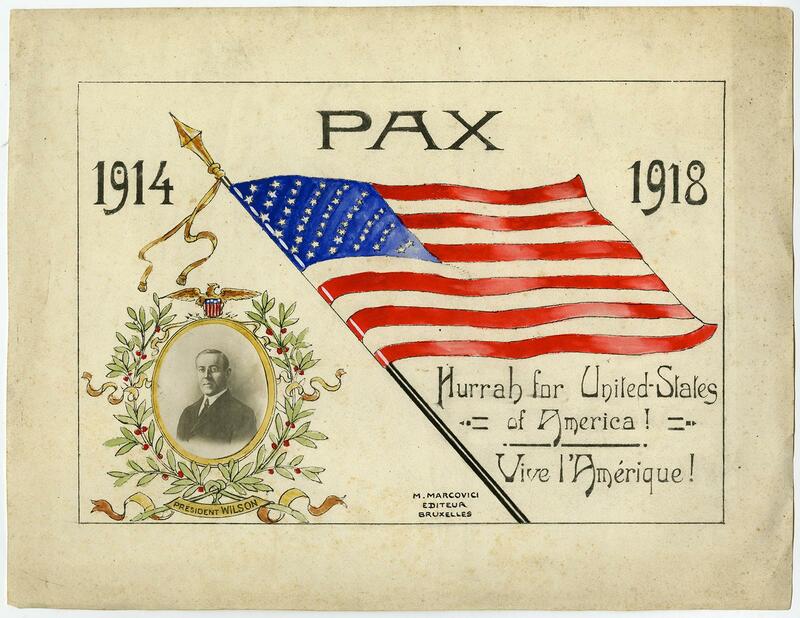 - Antique drawing, titled: '1914 Pax 1918, Hurrah for United States of America! President Wilson.' - Memorial drawing for the end of the First World War. With a portrait (attached photograph) of President Wilson. Pen and ink drawing with hand colouring on wove paper. Description: Made for the publisher: M. Marcovici Edituer Bruxelles. Rare original design.Artists and Engravers: Anonymous. Condition: Very good, given age. Some faint soiling and browning on image and margins General age-related toning and/or occasional minor defects from handling. Please study scan carefully. Storage location: RC-A12-32 The overall size is ca. 13.5 x 10.4 inch. The image size is ca. 11.1 x 7.6 inch. The overall size is ca. 34.3 x 26.3 cm. The image size is ca. 28.1 x 19.3 cm.